We made a card very similar to this at Convention last year. My hostess the other day wanted to use a wheel so the background was wheeled with the Retro Remix wheel. This wheel coordinates with the Hello Again stamp set. Supplies used: Hello Again stamp set, Retro Remix wheel; Crushed Curry, Melon Mambo, Whisper White and Old Olive card stock; Crushed Curry and Old Olive Classic Ink; Crushed Curry polka dot grosgrain ribbon; Modern Label punch. A few weeks ago, I saw several projects using the wing and branch from the Extra Large Two-Step Bird punch to make rose buds and tulips. How cute is that?!? Here is the other Sneak Peek I mentioned last week. This stamp set will be in the upcoming 2010-2011 Idea Book & Catalog! So why (you ask) am I showing you this now? Stampin' Up! is offering this in a fantastic Hostess Special in April! When you host a $350 (or more) workshop, you will receive the stamp set Awash With Flowers for FREE! It is part of the 2-Step Stamping Into Spring that starts April 1st! The bottom two cards were swaps from my trip to Champaign a couple of weeks ago. Book your workshop now - I have limited dates available in April! I demonstrated this cute basket at my workshop last week and gave it to my hostess. To make this basket, score a 6" x 6" piece of designer series paper at 2" on all four sides. Cut along score lines to the next score line on opposite sides as shown below. Fold sides up and adhere with little Snail adhesive. To make the handle, border punch a 1 1/4" x 11" strip of cardstock on both sides. Using the 1/16th inch hole punch, punch a hole at both ends of the handle and on both sides of the basket. Line up the holes and insert Rhinestone brads. You may also want to strengthen the sides with a few mini glue dots if you are planning to put candy in the basket. Make a larger basket by using a 12" x 12" sheet of designer series paper and score at 4" on all four sides. We made this card at my workshop last Friday evening. I know I've said this before but I just love how Stampin' Up! 's designer series paper coordinates with our card stock and accessories! Supplies used: Old Olive, Chocolate Chip and Pretty In Pink card stock; Sweet Pea designer series paper; Kisses Love Notes; Scallop Border Punch, Sweet Pea Felt Flowers; Chocolate Chip Classic Ink; Whimsical Words Sale-A-Bration stamp set. Don't you just love sneak peeks?? This set if from the upcoming Summer Mini Catalog! It's called Elements of Style. We received this set FREE at Leadership in January! This set is perfect for the Vintage look that is so hot right now!! The flowers are stamped in Black Stazon and watercolored with Watercolor Wonder Crayons. There is a little bit of Dazzling Diamonds on the flowers and I used the Lovely Lilac marker and Color Spritzer tool to add some dimension to the background. Watch for a 2010-2011 Idea Book & Catalog Sneak Peek in the next few days!! At our Sparkler Downline Meeting earlier this week, Brenda designed this beautiful card for us to make. The images from Thoughts and Prayers was stamped with Basic Black Classic Ink. Pretty In Pink Satin Ribbon, Pretty In Pink butterflies die cut with the Beautiful Wings Embosslit and Dazzling Diamonds Glitter complete the card. Well done, Brenda! We also made these cute cards - same color theme with the Bermuda Bay, Melon Mambo, Elegant Eggplant and Whisper White. With All My Heart was the stamp set used for both cards. These are two of the Make & Take projects we made on Saturday. The colors on the 6 x 6 Scrapbook page are Bermuda May, Elegant Eggplant, Melon Mambo, Whisper White & Kraft. The stamp set is With All My Heart. The flower is punched with the XL Fancy Flower Punch. These cute 2 x 2 gift cards are embellished with the Kisses Love Notes and the Sweet Pea Stitched Felt Flowers. The box they are in is die cut with the Bitty Box Die. Too cute!! We had a great time in Champaign on Saturday! It was a long drive home in the rain and we lost an hour due to the Daylight Savings time so needless to say, I didn't do too much of anything yesterday! But I do want to share some photos of te day with you! There were several demonstrators who were showing some great ideas and techniques! I just love this card! There is water and Dazzling Diamonds in the Sweet Treat cup! It's sealed with a window sheet so the water doesn't leak! There were several display boards as well. This card caught my eye! We love our "boys in brown"!! I'll share some more in the next few days! I had scheduled this to post Friday while I was on my way to Champaign. IL for our annual Spring Into Stamping event hosted by the awesome Kim Peck! The event was on Saturday. We stayed with my daughter and she hosted a shoe box swap in the evening (A shoebox swap is where we each design a project and put all of the materials for everyone to make one in a box. Then we pass the boxes around so everyone can make your card. I thought I would share my card! I must have missed a step in the process of setting this up to post at a point in time after I prepared it and when checking my blog found that it hadn't posted! Isn't technology wonderful?!?!?!? This project was inspired by fellow demonstrator Jackie Topa. It is made with the the Oval Scalloped Bigz Die. The egg is the oval and the scallops were cut apart to decorate the egg. The center card was paper pieced onto a 3" x 6" piece of white card stock, then run die cut again to just the get egg. I know you can't see it, but there is Dazzling Diamonds on the eggs as well. The bottom half of the Whisper White card stock was done with thePerfect Polka Dots Impressions Folder. This is one of the projects we are making tonight. We are using the Kaleidescope Designer Series Paper, Certainly Celery Satin Ribbon and Sherbet Buttons for the flower. The card base is Tempting Turquoise. The flower is layered on Certainly Celery and an eyelet border of Pixie Pink. The greeting is from Teeny Tiny Wishes. One of the new demonstrators in my downline, Brenda, stopped over the other day and showed me this card she made. It is gorgeous! I just had to take a photo of it and share it with you! 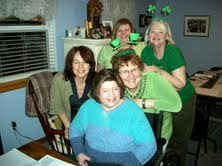 Before my workshop last night, the hostess, Eileen asked everyone to wear green. When I arrived she handed me Leprechaun headgear and said I had to wear them. She had Celtic music playing so after doing a little jig, I set up for the evening. As guests started to arrive, one of the guests' husband snapped a couple of silly photos. We had a fabulous time! Eileen wanted to use the Scalloped Heart of Hearts Embosslit so we made this "Lucky" card. The greeting is from Define Your Life. How appropriate for celebrating all things Irish! Supplies used : Old Olive and Naturals Ivory card stock; Scalloped Heart of Hearts Embosslit; Wide Oval and Scallop Trim Corner punches; Old Olive Classic Ink; Define Your Life stamp set. After stamping the greeting and punching it out, we ran the oval along the ink pad to ink the edges. I pulled out my Sweet Pea Designer Series Paper Pack and came up with these flower filled cards. The size of the card is 5 x 5 which will fit into our Medium Square envelopes. I punched flowers out of the dessigner series paper with the XL Flower Punch and the smaller flowers out of coordinating card stock with the Trio Flower punch. The centers of the flowers are also from the same designer series pack and the enamel brads. Quick and easy! !